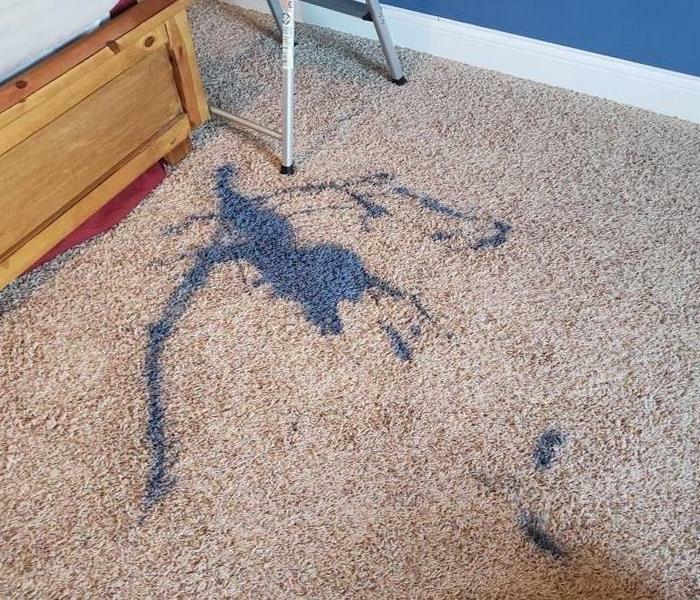 This client had a spill while painting a room in her home. Luckily, SERVPRO responded immediately and was able make the carpet "Like it never even happened." SERVPRO responds 24/7; so when you have an accident that needs fast action, call SERVPRO any time of the day or week. 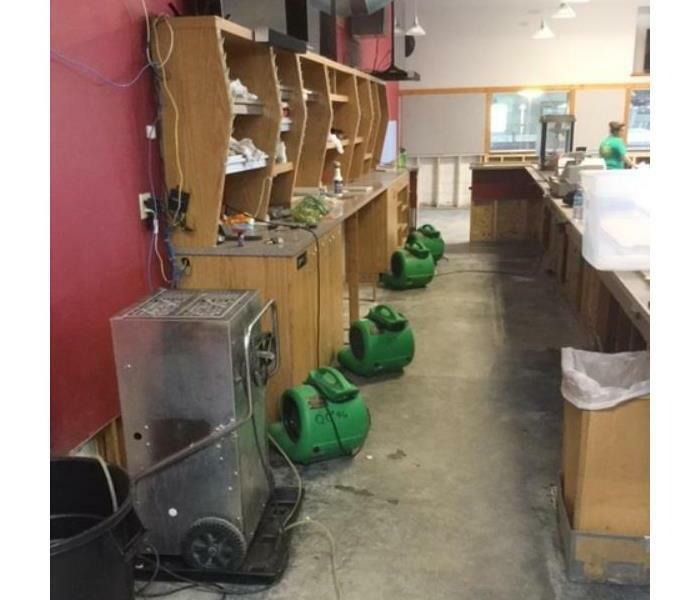 This photo features water damage at a local Quad Cities business caused by a leaking toilet. We responded quickly and worked with their schedule to avoid interrupting day-to-day business. This client had a water pipe burst in their crawl space. 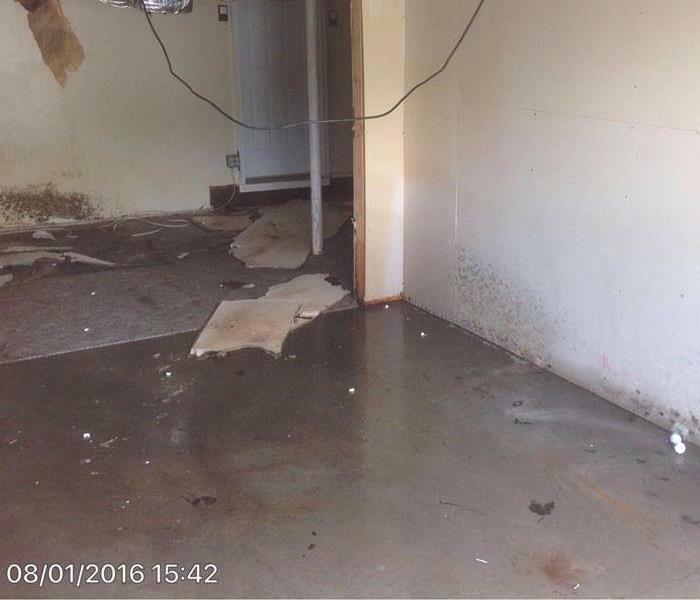 As the moisture spread through out the space, mold began to grow on the floor joist. 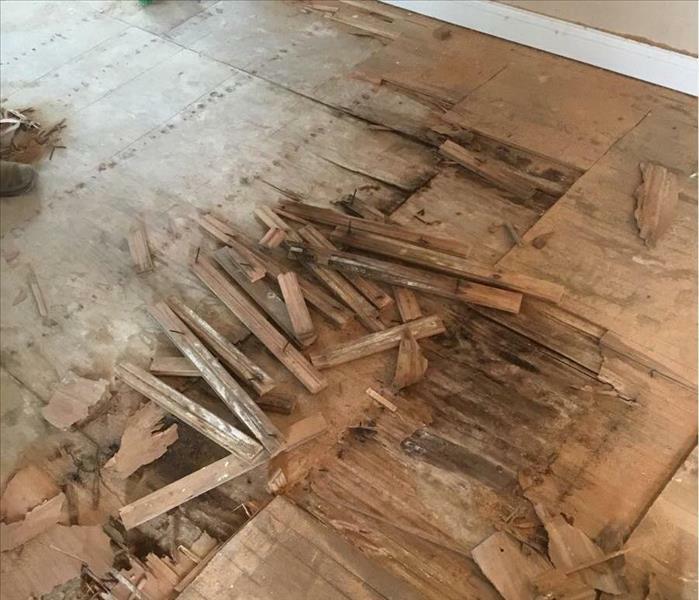 SERVPRO responded quickly and was able to remove the floor, mitigate the mold on the joist, and reinstall the floor in order to minimize the disruption to this family. 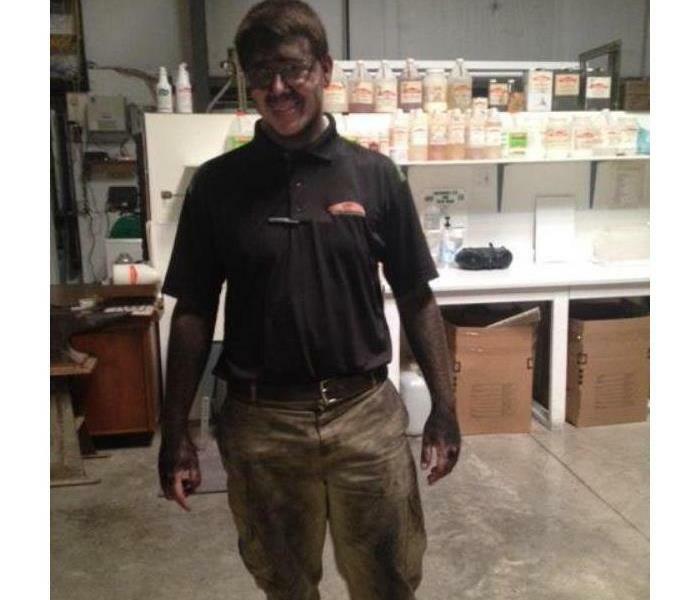 A client in Coal Valley, IL had a hot water pipe burst in a crawl space. This spread moisture throughout the crawl space, which caused the floor in their living room to swell and buckle. This also led to mold growth on the floor joist and insulation in the crawl space. 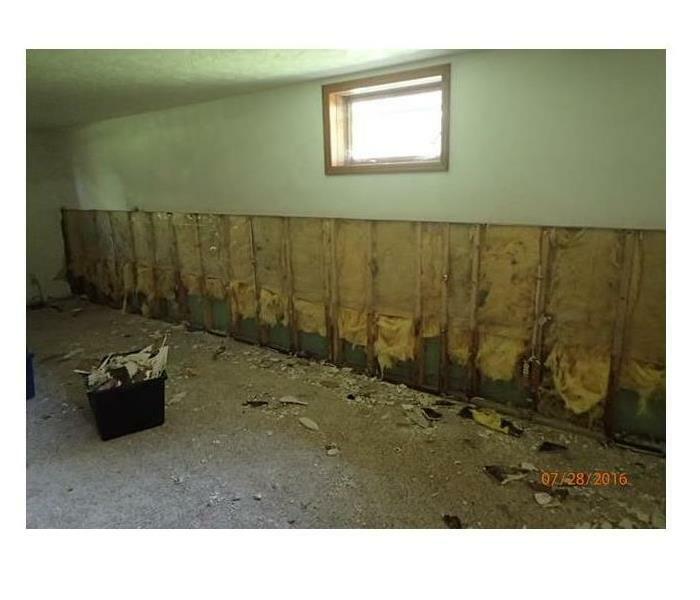 We removed the flooring, sub-flooring, insulation and cabinets; performed mold remediation on the floor joist; installed new insulation in the crawl space; installed a new sub-floor. 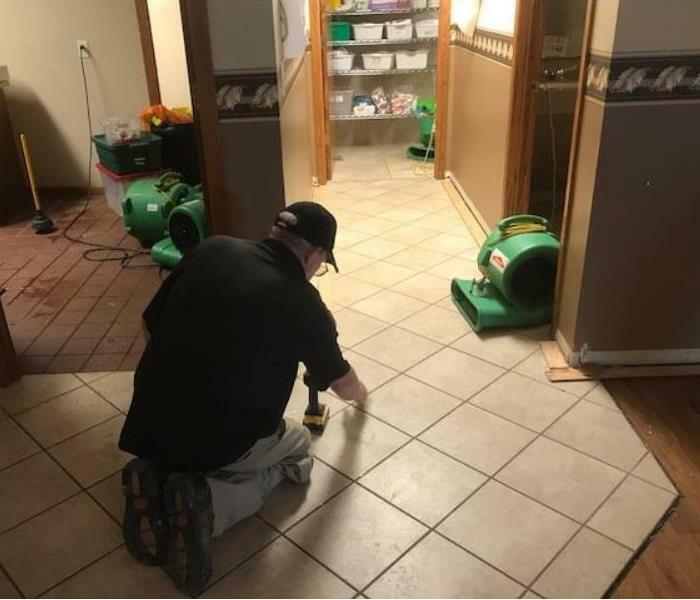 SERVPRO arrived quickly and had the work done within a week in order to get our client's house back to normal. This picture depicts the aftermath of a fire when we arrived on the scene. There was significant smoke and soot damage. If your property does suffer fire damage, we are readily available 24 hours a day, 7 days a week, and 365 days a year. Contact SERVPRO of Davenport/Bettendorf at (563) 386-3540. We are always here to help. A fire causes more than a charred structure— Heavy smoke leaves it’s mark. Heavy rain hit Bluegrass and caused some flooding. 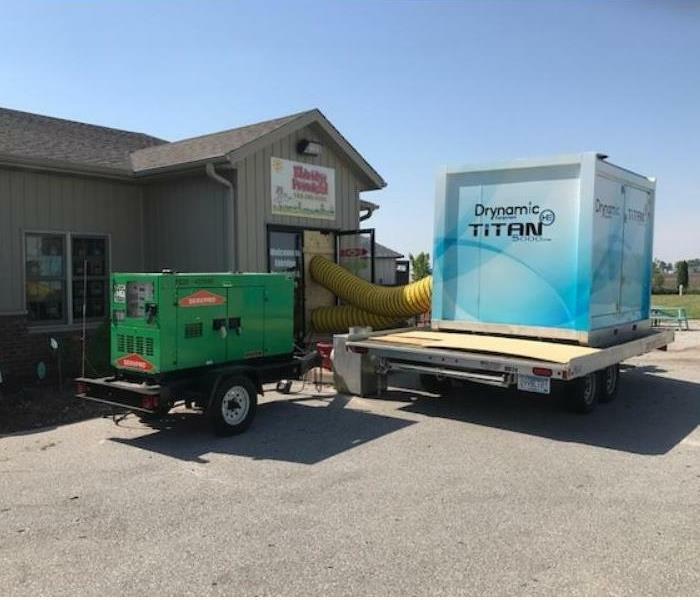 This photo presents our equipment in a store in Bluegrass, Iowa. Our state of the art equipment set by a highly trained, professional staff ensured that this structure would be dried out in no time. 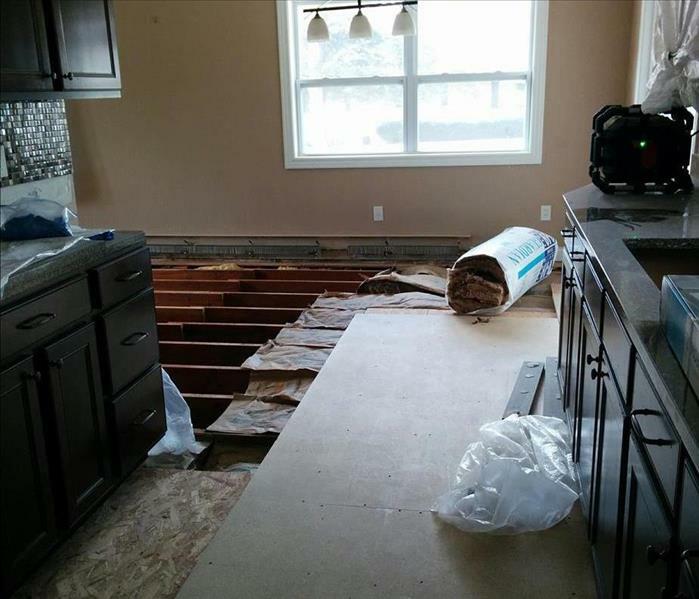 Whether your home or business, SERVPRO of Davenport/Bettendorf is here to take care of any storm damage or flood damage. If you have storm damage call SERVPRO of Davenport/Bettendorf today at (563) 386-3540. In this scenario there was heavy moisture in basement and therefore the walls were covered in a thick layer of mold. Our team cleaned the surface area first then, because the mold was so extensive, proceeded with the drywall cut-out so the homeowner would be assured that the mold had been eradicated. Our restoration team then proceeded to install new drywall and restore the basement to a preloss condition. "Like it never even happened." 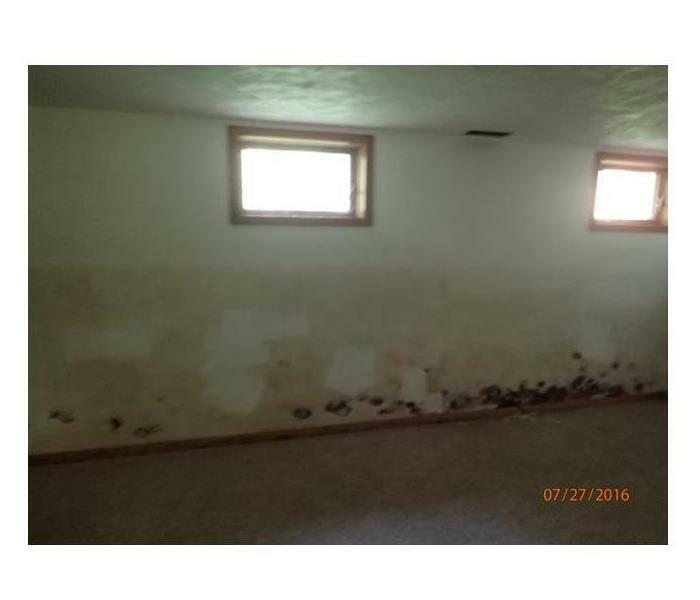 In this image you can clearly see black mold feasting on the basement wall. If you see visible mold, do not disturb it. You can inadvertently spread the mold infestation throughout your home. When mold is disturbed, the mold can release microscopic mold spores which become airborne and can circulate inside your home. If You See Signs of Mold, Call Us Today – 563-386-3540. Basement pre demo. Using our specialized equipment to rid mold. If you fear you have a mold problem, call SERVPRO of Davenport/Bettendorf at (563) 386- 3540. We are here to help. There are several types of mold and it can appear in many forms-- and it can grow anywhere as this picture proves. 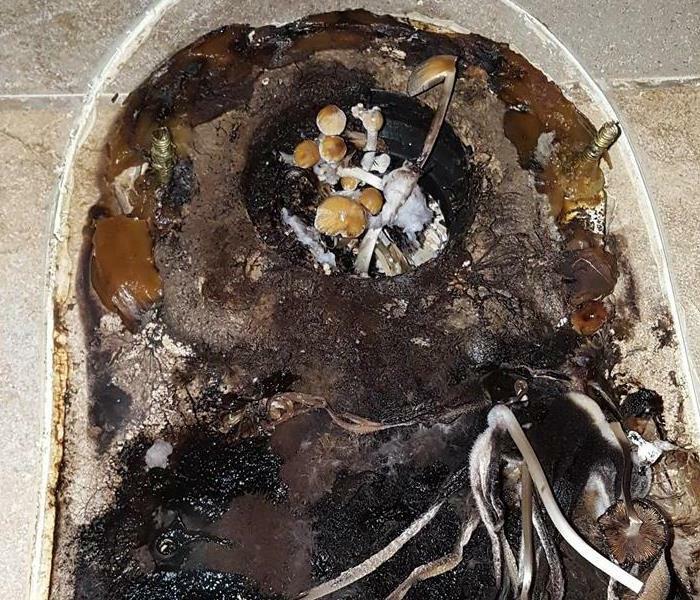 An unknown leak from this toilet lead to extensive mushroom growth. 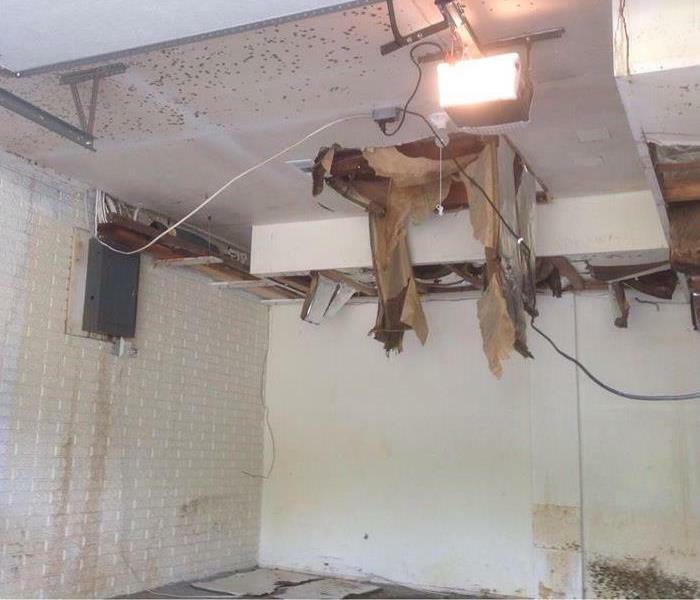 Fortunately SERVPRO has the proper solutions and equipment to not only remove the mold but to eradicate the presence so it doesn’t continue to grow or reoccur. 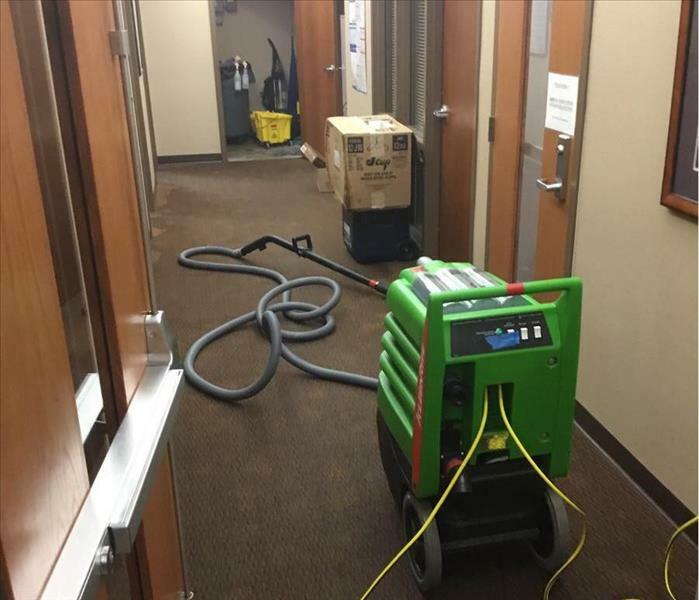 Here is a visual example of equipment placed inside a commercial property to mediate the storm damage situation. We were called on a job for a water damage at Dollar General. Keep in mind our mission is to help anyone we can. Whether commercial or residential--we are here to help. 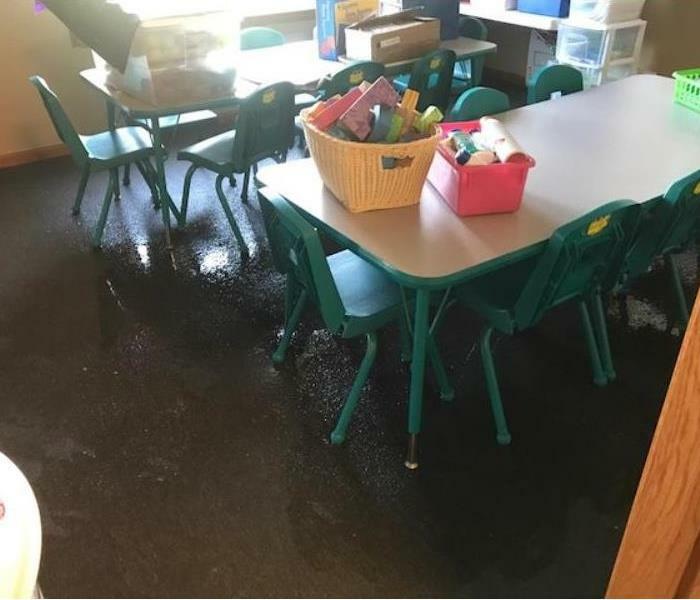 If you have experienced water damage in recent months, call the professionals at SERVPRO Davenport/Bettendorf at (563) 386-3540 to assess your situation and provide fast, effective clean up. After a smoke or fire damage, ceilings, walls, woodwork, carpeting and floors will need a thorough cleaning. SERVPRO of Davenport/Bettendorf will pretest to determine the extent of damage. We use specific equipment and patented cleaning products to clean and protect, disinfect, and deodorize different types of surfaces. SERVPRO of Davenport/Bettendorf provides specialized services which rid your property of offensive odors left by fire or smoke damage. It is important to note that we do not merely mask the odors with a fragrance, we seek out the sources of the odor and remove them. All of the restorable contents in affected areas will be professionally cleaned and deodorized. This includes area rugs, furniture, draperies, and upholstery. We will begin by inspecting and testing all fabrics in the structure in order to determine the most appropriate cleaning method. This includes electronics, art, wood furniture, kitchen items, clothing, bedding, bric-a-brac and much more. SERVPRO's patented contents tracker inventory system provides packout for all items while tracking inventory of your belongings. SERVPRO of Davenport/Bettendorf provides specialized services which rid your property of offensive odors left by fire or smoke damage. It is important to note that we do not merely mask the doors with a fragrance, we seek out the sources of the odor and remove them. 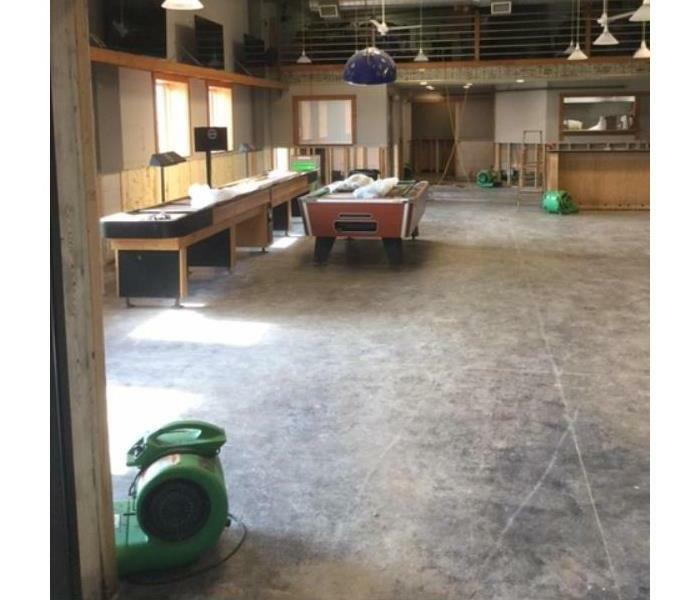 This was the aftermath of a water damage at a commercial property in Iowa. The owner was happy with how fast we responded and how quickly we restored the property. If your business suffers from a water or mold damage give SERVPRO Davenport/Bettendorf a call at (563) 386-3540. We are ready to help. Did you know there is actually a science behind the process of drying? Having the knowledge of psychometrics is essential to restoring a water damaged structure to its preloss condition. 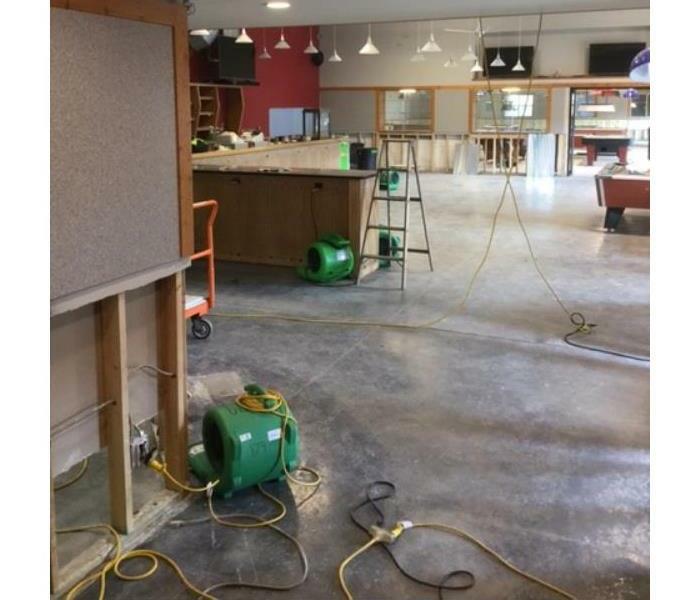 While your initial reaction may be to grab a few towels to mop up the mess and place a fan or two around the damaged area, SERVPRO Davenport/Bettendorf professionals are trained in the science of drying and follow strict industry approved standards to help lower the chances of any secondary damages such as mold. If your property suffers from a water or mold damage give SERVPRO Davenport/Bettendorf a call at (563) 386-3540. We are ready to help. 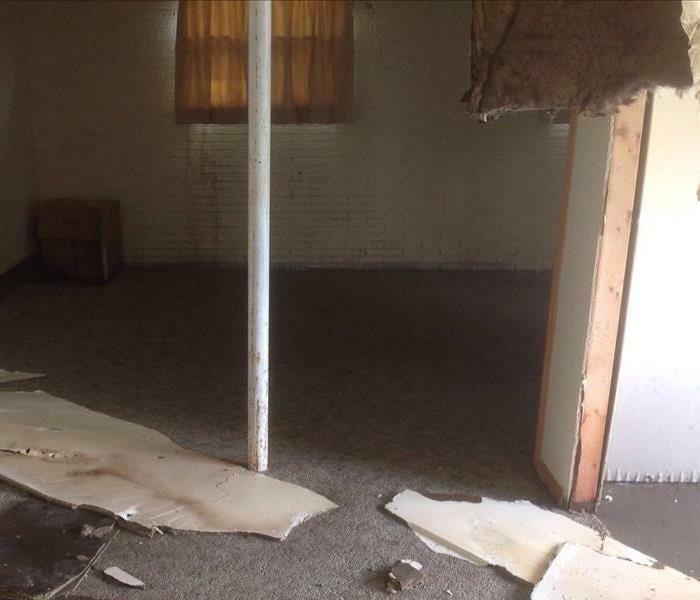 This was the aftermath of a water damage in Rock Island, Illinois. There was significant ceiling damage from excess water. The owner could not believe how quickly we repaired the property. 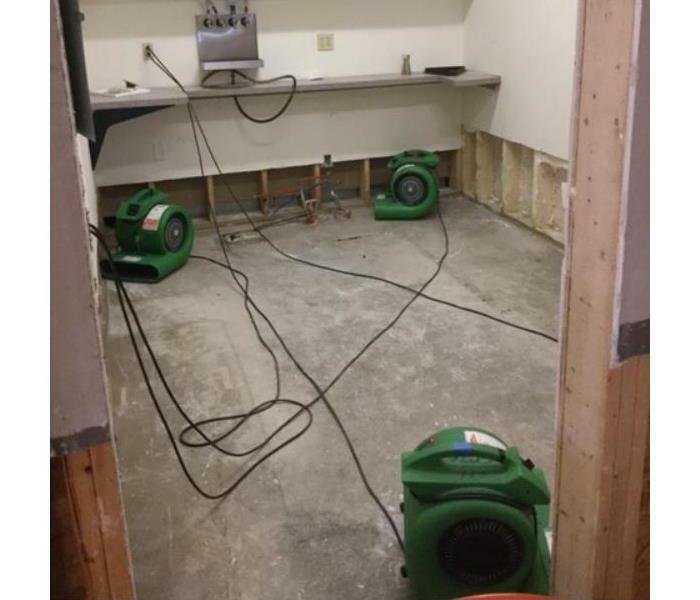 If your business suffers from a water or mold damage give SERVPRO Davenport/Bettendorf a call at (563) 386-3540. We are here to help. Above is a photo of a job we were called upon in Illinois for a residential property with mold in multiple rooms. We understand mold and mold growth and have the training and equipment to remediate mold in your home or business. When determining if you have a mold problem, be alert for: the presence of visible mold, strong musty odors, evidence of past moisture problems and excessive humidity. Above is a photo of a job we were called upon in Rock Island, Illinois for a residential property with mold in the basement. Mold can spread quickly; in as little as 48 hours it can become a problem in your home or business. Although every mold damage scenario differs, the general mold remediation process stays the same. We understand mold and mold growth and have the training and equipment to remediate mold in your home or business. Call SERVPRO Davenport/Bettendorf at (563) 386-3540 should you find visible mold on your property. No matter what time of day, or year, water damage can truly havoc on your home or business. But don't worry, SERVPRO of Davenport/Bettendorf's team of highly trained professionals are available 24/7/365. 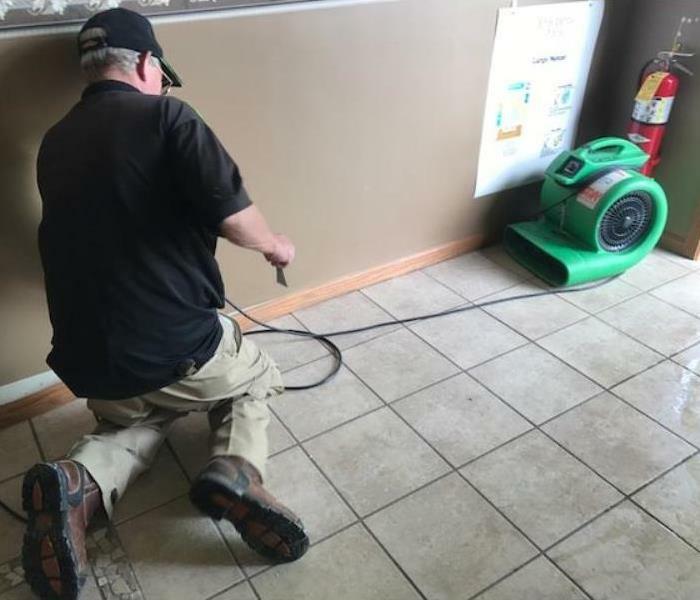 Rely on SERVPRO of Davenport/Bettendorf to make any water damage "Like it never even happened." Heavy rain hit the Quad Cities, as well as Clinton, Iowa and caused some major flash flooding. This series of photos depict our equipment in a bar/restaurant in Clinton, Iowa. Our state of the art equipment set by a highly trained, professional staff ensured that this structure would be dried out in no time. Whether your home or business, SERVPRO of Davenport / Bettendorf is here to take care of any storm damage or flood damage. If you have storm damage call SERVPRO of Davenport / Bettendorf today at (563) 386-3540. Heavy rain hit the Quad Cities, as well as Clinton, Iowa and caused some major flash flooding. This series of photos depict our equipment in a bar/restaurant in Clinton, Iowa. Our state of the art equipment set by a highly trained, professional staff ensured that this structure would be dried out in no time. Whether your home or business, SERVPRO of Davenport/Bettendorf is here to take care of any storm damage or flood damage. If you have storm damage call SERVPRO of Davenport/Bettendorf today at (563) 386-3540. We invest in the best equipment because it helps us restore your home or business more quickly and to minimize cost to you and your insurance company. Our equipment allows us to detect hidden moisture and extract standing water quickly and efficiently. We are available 24 hours a day to get your home or business back up and running. Our expertise includes restoration services for fire and water damage, including electronics restoration and document drying. We are also your business’s best resource for mold remediation. 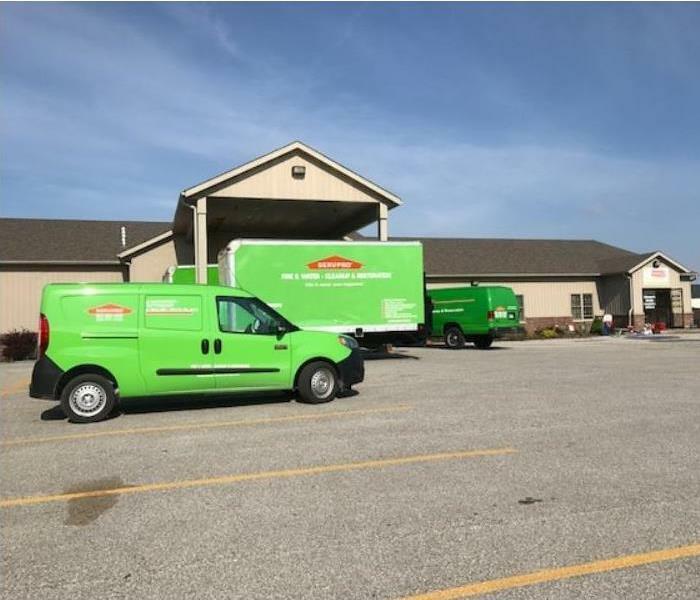 With SERVPRO's specialized system, no commercial job is too big for SERVPRO of Davenport / Bettendorf. 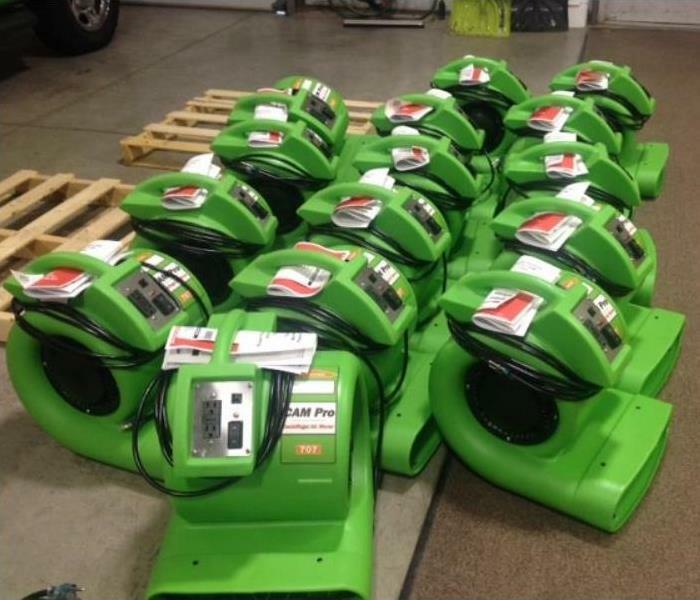 We have access to specialized equipment and SERVPRO teams from around the state and even the country to handle even the biggest damage to the largest of businesses. When fire or water damages your business you need a company that can give excellent results while minimizing the disruption to your employees and clients. SERPVRO of Davenport/Bettendorf has the experience and training necessary to get your business back to work, because we're Faster to Any Disaster. No matter what time of day, or year, water damage can truly wreak havoc on your home or business. But don't worry, SERVPRO of Davenport/Bettendorf's team of highly trained professionals are available 24/7/365. 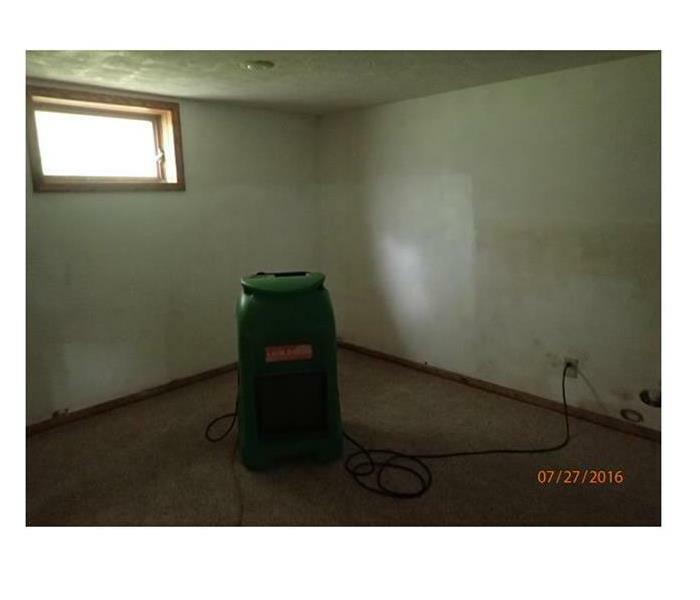 Rely on SERVPRO of Davenport/Bettendorf to make any water damage "Like it never even happened." 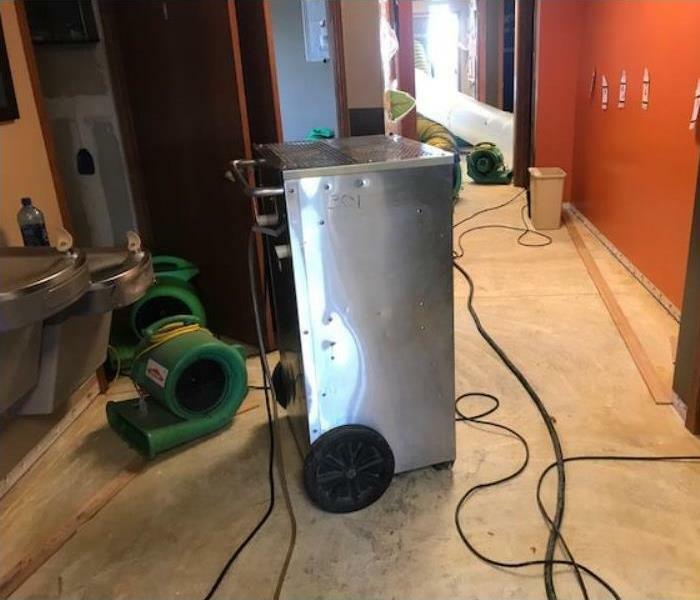 When water damage occurs at your home or business, rest assure that SERVPRO's specialized drying equipment will remove all of the excess moisture from the toughest places. 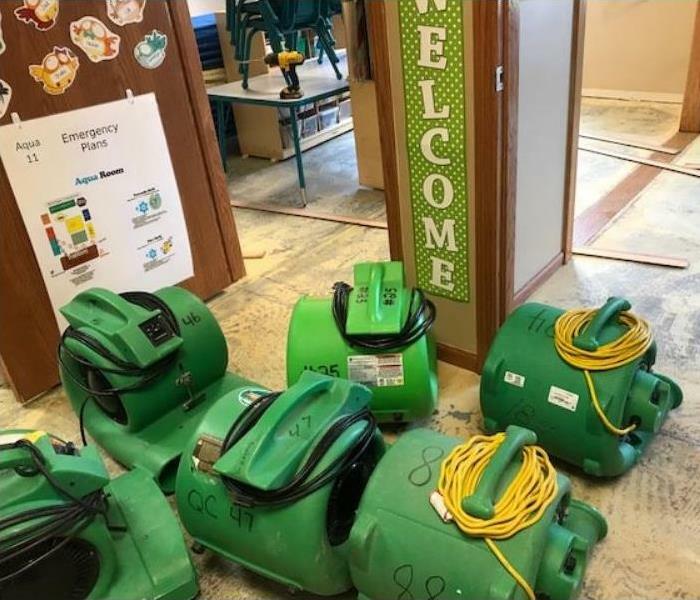 The equipment shown is a small fraction of the power that SERVPRO of Davenport/Bettendorf has to mitigate any sized water damage. It wasn't easy getting our crew together as they were trying to get out the door to help our customers, but it finally happened. Here is our crew, wishing you a happy holiday season! 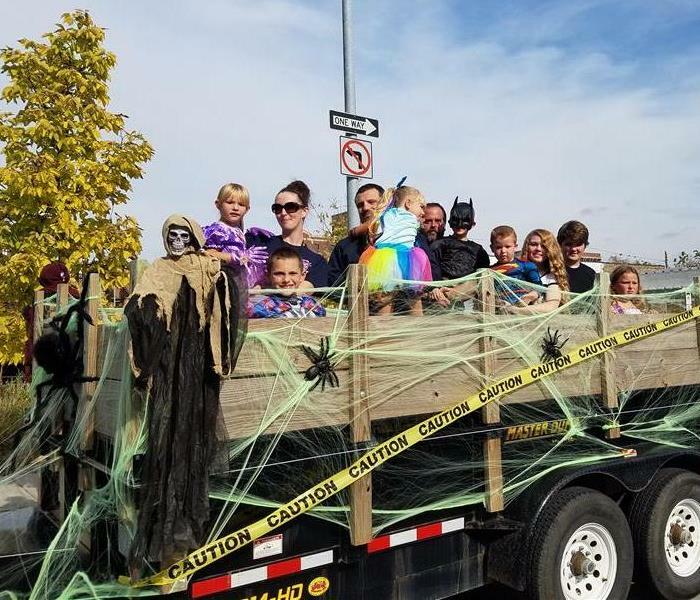 Here is some of our crew and their kids getting ready to throw candy to the crowd of the 2016 Davenport Halloween Parade. We want to thank everyone that showed up and hopefully you got some candy! Here is a picture of our home away from home. We are located at 7208 North Jebens Avenue in Davenport, Iowa! This is where all of our restoration jobs start. The new fans are here! The new fans are here! We got a whole bunch of new fans to help dry out water damages faster! Our fans get used so much that wear and tear quickly accumulates. So our crews are very excited anytime we get new ones. Its a dirty job but someone has to do it. 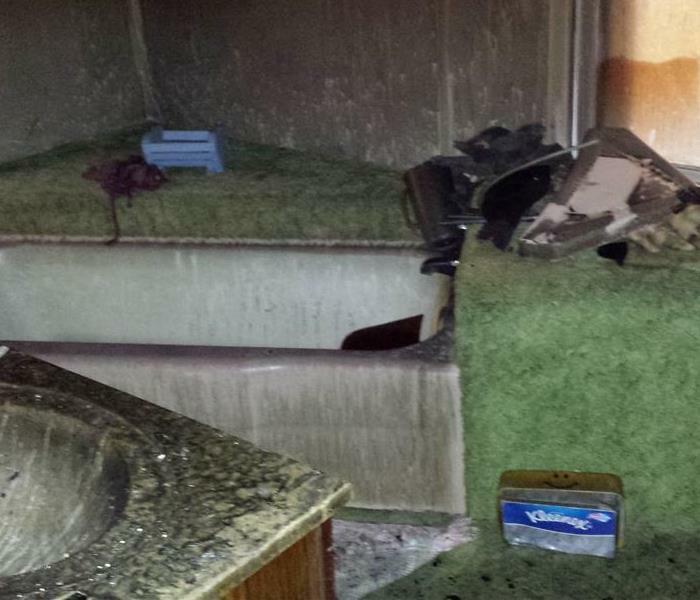 After working all day at a fire, John Erb needed to schedule his own restoration with a shower. This picture perfectly illustrates just how hard our crews will work to restore your home.